Companion Bike Seats are compatible with all types of different bicycle makes and models and sizes. Whether you have a mountain bike (with or without suspension), cruiser, path-and-pavement bike, or an ebike, there's a great chance your bike is compatible. The two important factors are wheel size and ability to install pegs. 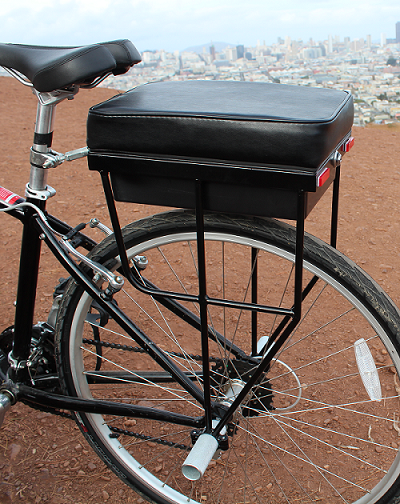 Companion Bike Seats are compatible with most wheel sizes, including 26in, 27.5in, and 700c wheels. The only wheels that don't provide enough clearance for our bike seats are 29in wheels ("29'ers"). We don't recommend installing our bike seats onto standard road bike wheels (700 X 23 C) if you plan on carrying heavy passengers, otherwise you may be patching and/or replacing your tire's inner tube more often than you'd like. The maximum clearance for your bicycle wheels (from the center-point of the axle to the bottom of the stash-box) is 15 1/8 inches (384mm). Companion Bike Seats require the ability to install foot pegs onto the rear hub of your bike for proper installation. If your bicycle currently has quick release skewers, you will need to replace the rear hub with a solid axle to install the pegs. We offer a great replacement solid axle here on our website, 10mm diameter (by far the most common size) and 187mm length, made by Wheels Manufacturing. 187mm length should provide enough room for the pegs and the axle nuts on most bicycles. If you're unsure of the size of the axle on your bicycle, we've put together an Axle Sizing Guide to help out. Print it out and match it up to your axle to identify the diameter and thread pitch. If you're still unable to match your axle with the sizing guide, send us an email at support[at]thebikeseat.com and we'll do some research. 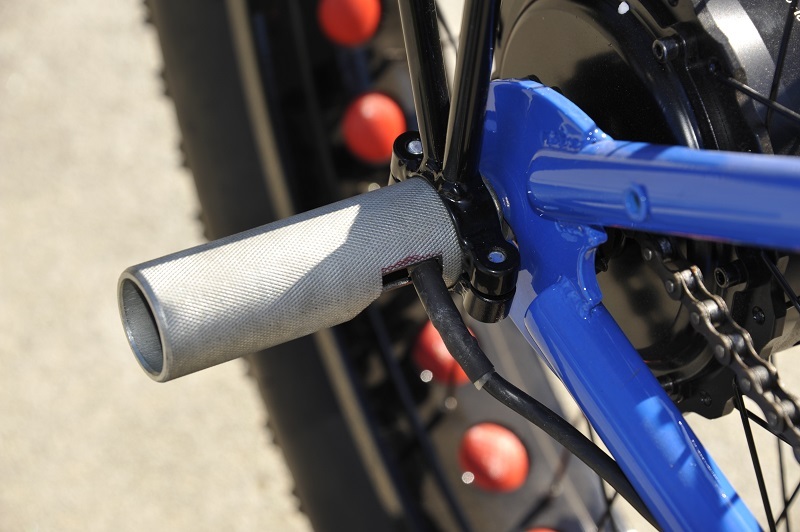 A solid axle consists of a steel rod that is threaded and attaches to your bike frame with two nuts. A quick-release hub uses a hollow axle to accommodate a skewer with a threaded nut on one end and a lever-operated cam on the other end. Closing the cam locks the wheel securely in place. Swapping your quick-release axle for a solid axle is straight-forward and relatively easy to do on your own. However, if you've never swapped a bike axle before, we recommend consulting with your local bike shop to make sure thee replacement axle is installed properly so that you don't put yourself or your passenger at risk when you ride your bicycle. Here is a great instructional video to help walk you through the process if you're comfortable doing the replacement yourself. If you have any questions about installation of your Companion Bike Seat, please email us at support [at] thebikeseat.com. Note - when unlocking and opening the stash-box of your bike seat for the first time, the lock might be a little "sticky." Push down on the top of the seat cushion directly above where the lock is while unlocking it (twist the key a quarter-turn and let the button pop out) and you should have no trouble opening it up. 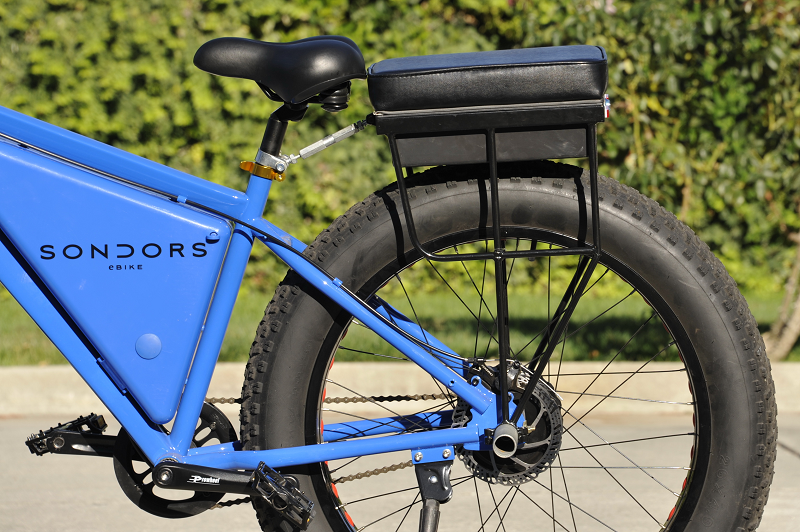 Companion Bike Seats are compatible with a wide range of ebikes that are on the market today. 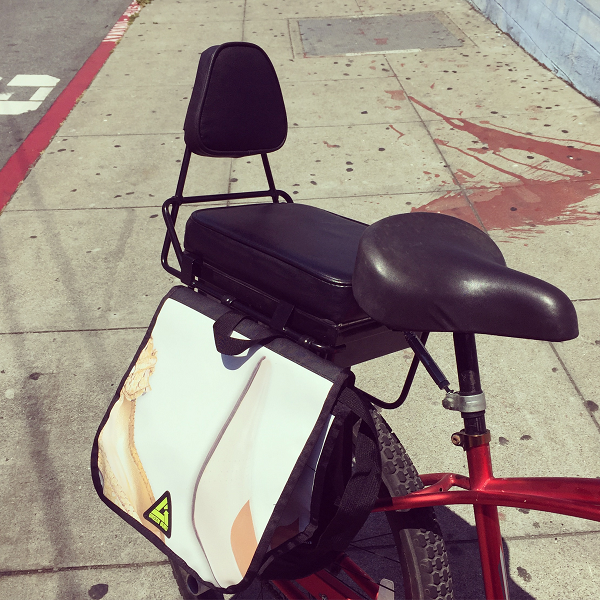 As long as you can install pegs onto the rear axle of your ebike, Companion Bike Seat is compatible. Some ebikes will work great with Companion Bike Seat straight out of the box. Others however have a larger axle, 12mm or 14mm diameter, which is larger than the whole in the pegs that come with the bike seat. Some rear wheel hub motor ebikes also have a wire that feeds into one side of the rear axle, making it difficult to install pegs. For these ebikes, we've designed customized ebike pegs that are threaded for these larger diameter axles, and have a cutout slot in one of the pegs to accommodate the wire feeding into the axle. Because the ebike pegs are threaded, they screw right onto the axle so axle nuts are no longer required to ​tighten the pegs to the axle. These ebike pegs are sold separately due to the additional machine work required for the threading and cutout slot. A number of folks have asked us if the bike seat can support panniers and the answer is yes! We offer two accessories that make it possible to hang panniers onto your bike seat, the bike seat backrest, and pannier hooks. The backrest has two "arms" that extend up the length of the bike seat frame that you can hang your panniers on just like you would a standard bicycle cargo rack. The pannier hooks hang onto the side of the stash-box, proving hooks to hang your panniers onto. The pannier hooks are only available for pre-order right now, but will be shipping out before the end of the year. Companion Bike Seats are also compatible with some bike trailers, depending on the make/model and how it attaches to the bicycle. Most bike trailers attach to the rear hub, so the hitch coupler must be compatible with the pegs for proper installation. 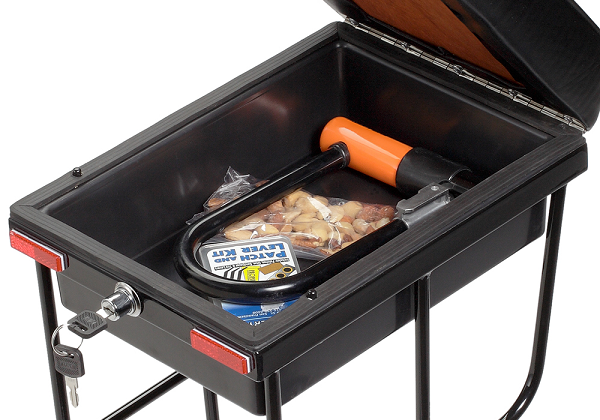 Aosom bike trailers (with a Type A coupler) are compatible with Companion Bike Seat. Burley, Schwinn, and InStep bike trailers are not. Riding your bicycle with a passenger for the first time may be a little awkward and different from what you're used to, so we've put together a Riding with a Passenger Guide with some tips to help out. We promise that after three or four rides, you'll get the hang of it and it'll be as easy as ... riding a bike! A list of published maximum weight capacities by bicycle manufacturer can be found here.